One of my favorite parts of Fall is finding new shoes that I can wear to jazz up my layered looks! Shoes can really make an outfit pop and turn a simple look into something spectacular. I remember for a while I really didn't like booties. I never felt like I could style them right and the ones I was into, they always looked weird on my feet. However, with growth and change, now I love the bootie, haha! I seriously want every single one I have listed here today. Which one is your favorite? I really love how you organized the pic with the list! Thanks hun! I know I wish I could buy them all! The grey block and the blush pink cut are calling my name! Drooling!!! Literally want them all! SO many cute booties! I really love pair number 7 and 8. Give me ALL the booties for fall. All of the cute booties! I want numbers 8 & 5! The rose gold one is really beautiful. So many cute shoes! I need them all. Can I have one of each? I especially love the leopard pair! That is my absolute favorite!! I've had 1, 4, 6, and 9 on my wishlist for a little bit now. 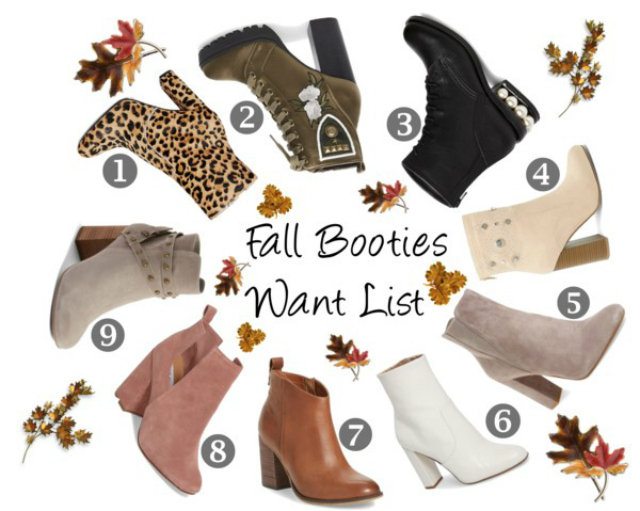 They're all so cute and I'm such a bootie fanatic during the fall and winter! Want! #8, 6 and 3 please! What great picks! Grey suede booties are on my list for this fall! I have got to snag some white booties Stat! Love this trend!